This article is from the Tea & Coffee Trade Journal (Oct '07). This publication contains many interesting articles on both tea and coffee. It is a great place to learn about tea and the growing regions. When one thinks of tea ceremonies, they are often assumed to be regal and stuffy events. Afternoon tea is actually a casual pastime that is seeped in rich traditions; honored since centuries past. Tea, the quintessential beverage enjoyed for centuries has been the main focus of some of the oldest rituals, which has surpassed many cultures and continues to be a recognized cultural institution. Principally, the tradition of drinking tea in the presence of company has been honored for centuries. Its roots can be attributed to many ancient societies and it is used as a relaxing forum for business, celebration, social meetings and an organized “snack-time.” Originally designed by the British as a method to ward off hunger pains before dinnertime. Today, tea ceremonies have evolved into a booming business where teahouses and hotels supply patrons with endless pots of steaming tea, pastries and sandwiches for the process of afternoon tea. Though a relatively novel pastime to some, tea ceremonies are actually seeped in rich traditions that many fail to quite admonish what secrets are contained in their beloved cup. The modern roots of tea rituals are believed to lie with Queen Victoria of Britain. According to information provided by the Fairmont in Vancouver, “legend accounts that one of Queen Victoria’s (1819-1901) “ladies-in-waiting,” Anna Marie Stanhope (1783-1957) is credited as the creator of afternoon teatime. “Since meals during lunch had become skimpier, the Dutchess adopting the European tea service format, where she invited friends to join her for an afternoon meal at the Belvoir Castle. The menu centered around small cakes, bread and butter sandwiches, assorted sweets, and, of course, tea. This proved to be very popular, as the Dutchess continued it when she returned to London, sending cards to her friends asking them to join her for “tea and a walking the fields.” The practice of inviting friends for tea was quickly picked up by other social hostesses.” Soon Afternoon Tea became the 'in-thing' for women of the upper-class society. Soon, society was following a ‘code of ethics’ for various ceremonies as they were all traditionally accompanied with fresh preserves, butter and spreads that became signature accompaniments to most ceremonies. There were even a few recorded contests that determined whose tea; pastries or preserves were the best. As the century progressed, afternoon tea became increasingly elaborate. By the 1880s, tea costumes were involved in ceremonies as women changed into long and elaborate tea gowns for the occasion. Tea fare can be incorporated with many items. Generally, afternoon tea involves bite-sized sandwiches, followed by a plethora of sweets and pastries and biscuits. For most afternoon tea ceremonies certain foods became popular during each season of the year. Fruit and berries were eaten in the spring and summer, while heavier starch items were reserved for the colder months. Placement of these items is also crucial to the construction of the ceremony. Food is generally placed on a three-tier curate stand, as follows, where scones are placed on the top tier, savories and tea sandwiches are placed in the middle and sweets are placed on the bottom. The protocol of placing scones on the top-tier is due to the fact that during the 1800s when Afternoon Tea first became popular, and modern kitchen conveniences did not exist; a warming dome was placed over the scones. The dome would only fit on the top tier. The savories and tea sandwiches, followed by the sweets, were placed on the middle and bottom tiers respectively. At the progression of each course, service would be provided to remove each tier. Traditionally, loose tea would be served in a teapot with milk and sugar. This would be accompanied by various sandwiches (customarily cucumber, egg and cress, fish paste (bloater), ham, and smoked salmon), scones (with butter, clotted cream and jam — see cream tea) and usually cakes and pastries (such as Battenberg, fruit cake or Victoria sponge). The food would be often served in a tiered stand. While afternoon tea used to be an everyday event, nowadays it is more likely to be taken as a treat in a hotel, café, or teashop that follows a similar three-tiered menu. 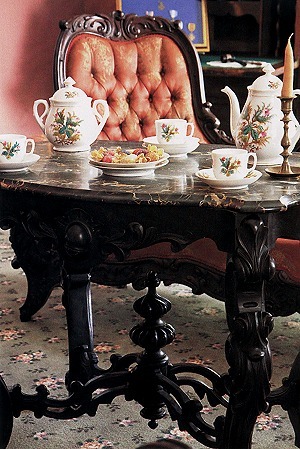 Beginning in the late 1880's, hotels began to offer tea service in tearooms and tea courts. Served in the late afternoon, many of these tea services became the hallmark of the elegance of the hotel, such as the tea services at the Ritz, the Plaza and the Fairmont. By 1910 hotels began to host afternoon tea dances and additional themed parties centered around tea. “The world of tea is a complex as the world wine. Teas grown in different regions around the world have unique charactertics and histories. Globally inspired & timeless by tradition,” said Janis Romeskie, Tea Sommelier. At the Fairmont hotel, they offer a “Champagne Tea,” which features raisin scones, open-faced sandwiches, éclairs, fresh strawberries with Devonshire cream & berry preserve and mini-cheesecake. Their “Traditional Afternoon Tea” involves a selection of Fairmont Teas, which is blended exclusively by the Metropolitan Tea Company along with scones, sandwiches and pastries. The menu also offers a “Children’s Bubblegum Tea,” with finger sandwiches of peanut butter and jelly, Canadian cheddar or black forest ham along with strawberries and chocolate chip cookies. Tea and Coffee Trade Journal enjoyed tea in the Lobby at the Fairmont where we indulged in the hotel's own famed blend, Tea at the Empress, as well as a sampling of an assortment of exquisite pastries through a traditional afternoon tea. The traditional afternoon tea involved a selection of fresh pastries, scones, Devonshire cream, strawberry preserves and fresh strawberries. There were “dainty finger sandwiches” including cucumber, watercress, ginger crème fraiche on white bread, smoked salmon, dill cream cheese on a wheat bread pinwheel and black forest ham, butter lettuce, pimento mayonnaise and grain bread. To complement this delicious spread, the wide-ranging tea selection runs from Darjeeling to Jasmine Blossom, from Earl Grey to lemon spice with endless pots of tea that included Herbal and Fruit infusions, Black Teas, Green Teas and Oramental Blends. The incentive of the afternoon tea brings out a slew of business meetings, women looking to re-intact afternoon tea or wary travels. The hotel feels that this provides an authentic atmosphere for how Queen Victoria may have enjoyed her tea. The Plaza has been serving afternoon tea since 1908. In addition to traditional English afternoon tea services of finger sandwiches, pastries and freshly baked scones served with clotted cream and homemade preserves, the menu features afternoon tea with a new twist, such as poached quail eggs with truffle mayonnaise on white toast, smoked Scottish salmon on granary bread, or a Maldavian tuna chapatti. The Ritz also offers a formulized ritual that is considered an institution in itself. They are a member of the Tea Council's prestigious Tea Guild. They are renowned for their selection of several varieties of tea, finely cut sandwiches, freshly baked scones, jam and clotted cream and a range of delicate pastries. The Afternoon Tea menu includes, Sandwiches, Smoked Salmon, Egg Mayonnaise with Cress Ham, Chicken and Mayonnaise, Cucumber with Cream Cheese, Freshly Baked Raisin and Apple Scones with Devonshire Clotted Cream and organic Strawberry Preserve along with Ritz Selected Teas or Ritz Blend Filter Coffee. The tradition of teatime has surpassed its roots but now involves a more intricate process that will be surely be honored for years to come.